BigRingVR can be used on Windows 7 or higher (32 and 64 bits) and Apple Mac OS X Yosemite (10.10) or higher. Download BigRingVR installer and double click downloaded file to begin installation, follow the instructions of the installer to complete installation. For details on running BigRingVR, please see Running Application page. Double click on the image, after which the Finder opens and the content of the disk image is shown. Open the application by double clicking on the icon, or copy it to the applications folder. For details on running BigRingVR, please see Running Application page. We are looking forward to see you on BigRingVR network! Double click downloaded installer to begin installation. For details on running Big Ring, please see the Instructions page. You don't need to download ride, unless your internet connection is below minimum requirement (2 mbps) - just Select the ride and click Start. If your connection cannot handle real time streaming we'll let you know. Download BigRingVR installer and double click downloaded file to begin installation, follow the instructions of the installer to complete installation. To use BigRingVR with ANT+ sensors, you will need to use an ANT+ USB stick (e.g. Garmin or Suunto). If you have already used this ANT+ stick with other programs, like Zwift or Trainerroad you already have the right driver installed for this USB ANT+ stick. To install the driver, simply insert the stick into a USB port on your computer. After a few seconds, Windows will start to download and install the driver for your device. Wait for this to complete before continuing. 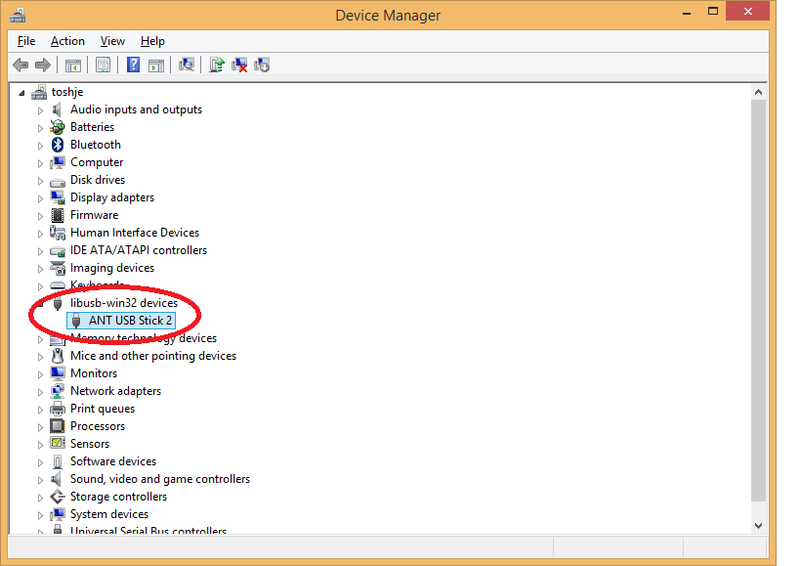 When opening Control Panel -> Device Manager you will see the device listed.